Dr Michael Wu has been performing Carotid Endarterectomy in Melbourne for over 15 years. A carotid endarterectomy is performed in a sterile surgical suite or standard operating room. You may go home the same day or stay 1–2 nights after the procedure depending on your medical condition. You receive a local anesthetic or general anesthesia. Your vascular surgeon makes an incision at the front of your neck. After removing the plaque from the artery your vascular surgeon repairs the artery by stitching in a natural graft (formed from a piece of vein from elsewhere in your body) or a woven patch. What is the recovery time for carotid endarterectomy? Is carotid artery surgery safe? 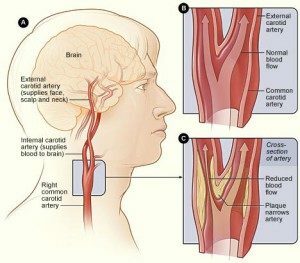 Surgery to remove the buildup in your carotid artery may be done if the artery is narrowed by more than 70%. If you have had a stroke or temporary brain injury, your doctor will consider whether treating your blocked artery with surgery is safe for you.